Redis is known for its sub-millisecond latencies and high throughput. For many interactive applications, responsiveness is key to engaging and fluid experiences. However, keeping a large amount of data in RAM with Redis can be expensive. Today many applications either pay a premium for storing sizable datasets in RAM with Redis or they limit Redis database use to the most valuable data and augment Redis with disk-based relational or NoSQL databases. Applications that utilize complex functionality such as consumption based pricing, resource usage limits, measuring/counting at scale and normalizing resource usage (such as traffic shaping) require extremely high performance and low latency, particularly when dealing with streaming data. Redis Enterprise simplifies the implementation of metering providing high performance, and scaling, even at very high data volume and velocity. 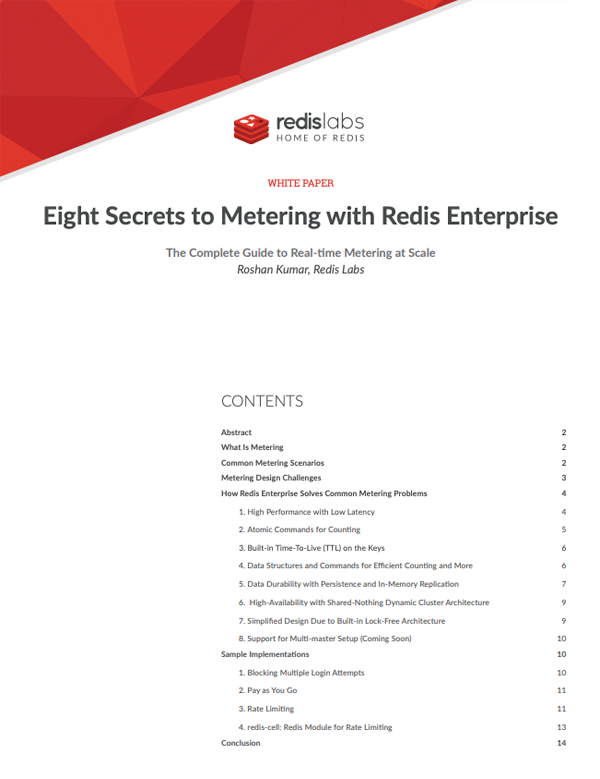 This whitepaper addresses many common challenges you may face when working with metering algorithms and how Redis Enterprise solves these effortlessly and with great resource efficiency.